Electrical circuiting is one of the most time intensive parts of the building electrical design process. How many days or weeks did you spend circuiting your last project? How would you like to be finished in minutes or maximum a few hours instead? DraftLogic Electrical circuits in compliance with user parameters for safety/demand factors, diversity, panel types, and panel service areas. You decide to manually circuit any, all, or none of your project and have DraftLogic Electrical do all the remaining. Seconds of your time to launch the process and the entire drawing is circuited, after which you can remove objects from circuits, add objects to circuits, change breaker sizes, make new circuits, or remove circuits. Circuits are assigned to panels in mixed fashion or with lights and receptacles going to separate panels. When mixed, the user tells DraftLogic Electrical whether to put lights across the top of the panel or on the left side of the panel. 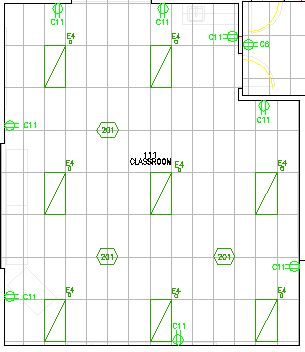 Each type of device can be directed to a panel room or specific panel. There can be any number of different panel rooms or preplaced panels with specified service areas in your project. The services areas can be for emergency powered objects, lights, receptacles/small motors, or mixed. Large motors project wide can be directed to go to power panels, a motor control center, or your main distribution panel. numbers to each of the lights and receptacles. DraftLogic Electrical includes the Circuit Manager dialog, which gives you complete control over the circuits in your project. You can individually add and remove objects to circuits, select breaker sizes, and create parent / child relationships between power tree members. Information about the panel you have selected as the parent panel for your manual circuiting operation is displayed at the top of the Circuit Manager for quick reference. The Circuit Manager is pictured to the left. In this example, we have selected panel 'E' as the parent panel to work with. On that panel, we have selected circuit #4, which is a lighting circuit. DraftLogic Electrical has retrieved the detail of the ten devices that are serviced by that circuit and is listing them in the 'Objects In Circuit' section, along with actual load and maximum load information. 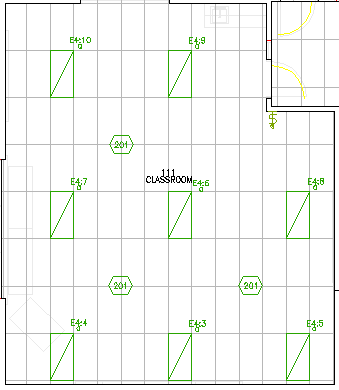 Below, we see a clip from the floor plan where DraftLogic Electrical has temporarily changed the circuit numbers to have a unique suffix to tie them to the devices listed in the Circuit Manager. These labels automatically update as you change circuits in the Circuit Manager and disappear when you change circuits or exit the Circuit Manager. Both the circuits that DraftLogic Electrical creates automatically and the circuits that you create or modify are reported on in the same manner. They are detailed in the Panel Schedule, seen to the right, and their loads are totaled for the bus / breaker / feeder calculations seen at the bottom of the Panel Schedule. These same detailed calculations are performed for the Single Line Diagram. To the right, we see the complete Panel Schedule for Panel A in a different project than the above examples. In the center section, you can see the wattage total for each circuit, the phase that each circuit is tied to, the breaker size selected for each circuit, and the number of poles tied to that circuit. The Panel Schedule header includes information about the panel & the fault level calculated at this point in the power tree. The Panel Schedule bottom area summarizes the loads both by phase and by load type, applies diversity factors to each load type, and uses the resultant total load to calculate the bus / breaker / feeder for this panel. • Projects are completed faster through saving the user hundreds of: keystrokes to populate attributes, clicks to place labels, and repetitive low value decisions. • Ensures circuiting is accurate by precisely performing load and circuiting calculations time after time. DraftLogic Electrical prevents overloads and mismatched voltages with robust circuiting quality assurance routines. • A complete set of detailed panel schedules for all panel & panel-like devices in the whole project are generated with three mouse clicks allowing the user to review circuiting decisions, loads, and the resulting bus / breaker / feeders.